Took a short train ride out to the scenic Hungarian countryside with Rita, and it was a great time. Got to see some awesome ruins, some beautiful country and had a close encounter with an amazing hawk. Rita is wonderful and I would recommend her to anyone. I learned a lot from her about Hungary in general. The Visegrád/Danube bend area has become a leading contender in my quest to find a place to retire abroad in the future. Thanks Rita!! Rita was extremely knowledgeable of the city, it's history, it's culture, it's food, and it's architecture. I think she must be a "closet" archaeologist. She was excited to guide us through the city's history. Not only did we see the city as it is, she included a personal library of photographs from the past, giving us a deeper appreciation for the changes that have occurred throughout history. I highly recommend her and tours by locals. The process and the person were both amazing. Great tour with Rita. Loved our tour. Thanks very much. This was our second tour with Rita. We loved seeing the countryside, the Basilica, and the Marzipan museum. We had a fun, informative day and highly recommend Rita as a tour guide. Rita was a wonderful guide. She provided an insightful overview of Budapest—at a nice pace. She showed us how to use public transportation. We saw things that we wouldn't have gotten by ourselves and she gave us lots of tips for better using the days we were there on our own. We had a lot of fun. She was informative and prepared. We appreciated hearing about the history of the country. Our group of six adults would highly recommend her. My group and I have done many private tours over the years and this was one of the very best. Rita is fantastic and has a love and passion for this tour. There were so many things packed into our day. The restaurant she took us to was wonderful and such a fun experience for us. If you are going to be in the Budapest area, don't miss the opportunity to plan a day with Rita. You will not be disappointed. TOUR GUIDE RESPONSE: Thank you for choosing me to guide you in the Danube Bend. It was my pleasure to show you a bit of the beautiful Hungarian countryside. I wish you all the best. We enjoyed our tour with Rita very much. She has extensive knowledge of Budapest and Hungary and we learned a lot by listening to her narrative and asking many questions. She was very punctual (actually early) as to our start time and helped us negotiate the public transit system in Budapest making it quite easy to cover a lot of ground in our 4 hours. We prefer to use local guides when possible as it allows us to tailor the tour to our needs and cover the places we want to see. Highly recommended. TOUR GUIDE RESPONSE: Thank you for joining me on this tour. It was my pleasure to guide you in Budapest. Wish you all the best. Rita was great. She is very easy going and friendly. Her knowledge of Hungary's history was amazing. I learned so much. She was very accommodating. We spent 2 days with her, wish it could have been more. Her English is excellent. Totally recommend her. Rita was excellent!! We had a private group of 3 for a 6 hour Budapest tour. We came in knowing nothing, and left with a plethora of knowledge about the city and it's past! I highly recommend Rita!! Thanks Rita!! We gave used many guides in the past - many of whom were very good. But Rita T! She sets a new standard. Our experiences with her far exceeded our very high expectations. She not only knows what she is talking about but presents information in an interesting and even entertaining fashion. But — best of all she is a great person with a wonderful sense of humor and real desire to tailor her tours to your interests. You will not be sorry having her as your tour guide. TOUR GUIDE RESPONSE: Thank you for Jeffry, it was my pleasure to guide you in Budapest. Wish you and your family all the best. Rita was a wonderful guide and very knowledgeable. We toured a lovely town with a medieval castle and history, Visegrad, which is on the Danube Bend, and then back to Budapest to visit the Buda castle area. We thoroughly enjoyed learning the history of Hungary and post WWII. This was a wonderful tour. Just the right amount of information and tailored to our interests. Rita is charming and incredibly knowledgeable. If you are coming to Budapest I would strongly recommend a tour with Rita! 5 out of 5!!! Rita was an amazing guide for our 16 people who had just landed and were tired and hungry and only had an afternoon to see and learn about the city. She was knowledgeable and patient and made our day perfect. Thank you!!!! Rita's extensive knowledge of the city's history as well as current developments meant we received an excellent overview of Budapest. The mix of walking the streets and catching public transport (including the fantastic old tube line) gave us a feel of being a local while continually learning about the interesting evolution of one of great cities of the world. Without a true local like Rita we would not have had the truly excellent experience that we did. Rita was fantastic. Very thorough and paced the tour in accordance with our needs. TOUR GUIDE RESPONSE: Dear John, Thank you for joining me on my tour. I wish you all the best. Rita was warm, engaging, considerate and incredibly knowledgeable. She made the tour feel fun and educational, doubt you can find a better guide! This tour was excellent in that it took us out of the city and into the countryside to see more of Hungary than just Budapest. It involved taking a train, ferry and micro bus which all were enjoyable and added to the "local" experience. Rita's detailed knowledge of the Castle and its place in Hungarian history make the tour, a must see. TOUR GUIDE RESPONSE: Dear Richard, Thank you ever so much for your kind words and for choosing me to be your guide. Have a safe journey home and I hope I'll see you all again in Hungary. Take care and let me know when your first Hungarian meal is ready. I might just pop over to check it :) Wishing you all the best. Rita was knowledgeable and friendly. We enjoyed our tour of Budapest. TOUR GUIDE RESPONSE: Thank you for joining my tour. It was my pleasure to guide you in Budapest. Wish you all the best. I spent two days with Rita touring Budapest and Danube Bend. She is a great tour guide. She is extremely knowledgeable and was well prepared to make Budapest the highlight of my trip to Europe. I highly recommend Rita. Rita was great. She was extremely knowledgeable, engaging and well organized. She was pleasant to spend the day with and we enjoyed her and the tour immensely. We have had other tours in other cities and she is the best. We recommend her very highly. Rita was a wonderful guide for our day in Budapest. Her English is wonderful, she is articulate and knowledgable about the history, the current events and more. We thoroughly enjoyed our time with her and learned so much about the country and the history, as well as seeing some known historical places and some only known to locals. I would definitely work with her again if we ever go back to Budapest! TOUR GUIDE RESPONSE: Thank You for joining me. Rita was a great tour guide. We learned a lot about Budapest. She brought us off the beaten path which was the best. I would highly recommend a tour by Rita. Thank you Rita for a great day. Rita was a delightful tour guide. She was very knowledgable and flexible. She knew the history of the areas and told the story of the people with passion. We enjoyed our day with her very much. We highly recommend her. TOUR GUIDE RESPONSE: Thank you Teresa for joining me. I'm glad I had the chance to show you a bit of our lovely countryside. Hope to see you again. Wish you all the best. Rita was a wonderful guide, highly knowledgeable and great company we would highly recommend. TOUR GUIDE RESPONSE: Thank you Bonnie, it was great guiding you in Budapest. TOUR GUIDE RESPONSE: Dear Pierre, Thank you for joining my tour. It was a great getting to know you and your family and showing you Budapest. We had such a wonderful time with Rita. Her knowledge and engaging personality made this tour one of our best; I only wish we had several more hours to spend listening to her enthusiastic knowledge of this wonderful city. I give our tour and our guide 5 stars, and I assure you we will book with Rita when we return to Budapest. Rita stood in for Melinda and gave us a memorable day at Godollo and Szendentre. She is a great communicator and made the day fun as well as informative. We had lunch in a great little restaurant, and tried other Hungarian food. TOUR GUIDE RESPONSE: Dear Geraldine, Thank you for joining me on this trip and wish you both a wonderful time in Hungary. Best regards, Rita T.
Rita was a fantastic tour guide. She was able to give us a ton of information about everyplace we went. She knows her history and was able to communicate it in an interesting way. Rita is funny and personable and we had a great day. Rita is the perfect guide, super accommodating, fun and with broad knowledge of history and fun facts about Budapest. If you want to enjoy a different tour experience with a local flavor, her tours are highly recommended. TOUR GUIDE RESPONSE: Dear Daniel, Thank you and your family for joining me. The Buda Castle district is full of treasures and I'm glad I had the chance to share it all with you. Hope to se you again. Best wishes, Rita T.
Rita T was a fabulous tour guide. Her presentation covered all elements of interest to a history and art fan as I. She can tell the story so well with historical photo to provide further emphasis to wherever we went. TOUR GUIDE RESPONSE: Thank you for choosing me to guide you through history in Budapest. I had a fab day with you and hope to see you again in Hungary. Rita T was our guide in Budapest during our three-day visit. She was knowledgeable, informative and friendly and punctual at all times. She was proud of her heritage and happy to share her life experiences with us. She really made our trip extraordinary. Thank you Rita! TOUR GUIDE RESPONSE: Thank you and your family for joining me. I had a great time too guiding you in our wonderful capital city & Szentendre and sharing our history with you. I hope to see you again. Best wishes to you all. Rita was a delight with fantastic knowledge of history & historical persons & events. 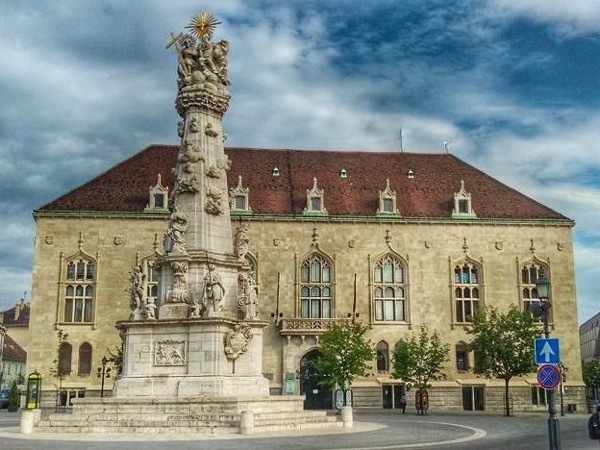 This tour was the perfect way to begin our journey through the Danube Region. With information beginning with the Mongel invasion to current day events the beauty of Hungary was displayed before us. Rita was a fantastic guide and showed us her native city with enthusiasm. We enjoyed spending the day with her! Rita was a perfect choice for our daytrip to the "countryside" of Budapest. Her personality pared with a very good knowledge about the history was the key for a nice experience. And of course her english is way better than mine. I would definitely recommend her to other friends who are planing to visit Budapest. Rita is very competent , also very pleasant. I highly recommend her. Rita was very informative and friendly. She lived in England for 10 years, so her English is very good. Her tour includes art galleries and an apothecary's house, which you would miss completely with more commercial tours. She exudes a real passion for her country, which is great. TOUR GUIDE RESPONSE: Thank you for choosing my tour and for being só interested in our history. I had a great time with you and your family and hope you really enjoy the rest of your stay.Wish you all the best and hope to see you again in Hungary. Rita was great. Met my son and I at our hotel and took us on a very informative and fun tour of Budapest. Would highly recommend Rita for your tour of Budapest. TOUR GUIDE RESPONSE: Thank you Bryan for choosing me to be your guide. I'm glad you both had a memorable day in Budapest and hope to see you again so I can show you some more of my beautiful country. Wish you all the best. I went on the history an wine tour today, were I was meet by Rita at the train station an caught the train to her town an walked through a castle an palace wich was amazing, Rita is very informative an full of knowledge an very easy to get along with, we then had lunch witch was beautiful an caught the train back to vac were we did some wine tasting an mummy looking, If your ever in Budapest an want a tour guide I highly recommend this lady, she does all different tours, Rita your a legend cheers Mate. Rita is outstanding! She is very knowledgeable, thoughtful, friendly and personable. Her love of Budapest shines through. You could not ask for a better guide. She truly made us feel welcome and answered all of our questions. Her English is perfect. I would not hesitate to recommend her for anyone. Five stars, no question! We loved Rita, booked her for a second day at the completion of the first!! Punctual, friendly, knowledgable, I would highly recommend and will use again if we return to beautiful Budapest!! Excellent tour. Very knowledgeable and upbeat which made the tour enjoyable. We had a great day with Rita. She picked us up at the hotel, helped us get our transportation ticket and took the train to Vac. On our quick train ride Rita told us some of the history of Budapest and Vac. In Vac we walked the city as Rita told us about how the mummies were found before we went to the museum. We had cakes at a local café where Rita explained what were in all of the cakes. I had a chocolate rum that was delicious!!!! After the cafe, the wine museum, tasted wine, cheese & Bread. We especially enjoyed the opportunity to see some of the Hungarian countryside and the lovely views of the Danube Bend. Rita shared her extensive knowledge of the history of the area. She also gave us insights into the palinka and tokaj culture. Her friendliness and openness were a great addition to our day. We learned a lot about Hungary in the course of our day together. Rita is a wonderful tour guide. We had a great day and she showed me a lot of things. I learned so much. The transportation challenges over the weekend with trains closed etc made for longer travel times which was disappointing but out of the control of the Tour service / Rita. Thanks! We all had a great time! Rita is a great guide - knowledgeable and fun. She took time to get to know everyone in our group. Rita is very knowledgable about the place she took us to. She's accommodating and we had an enjoyable day with her as our guide. TOUR GUIDE RESPONSE: Thank you for choosing me to be your guide. It was nice to get to know you all, you were great company. Now that you've met the 'real' Santa :)I wish you a very happy Christmas! We had a great day with Rita as our guide taking us to the 3 small towns around the Danube Bend. She is knowledgable and accommodating to our requests. She's done a good job and all 7 of us are very satisfied with her. Rita really knew the history plus could add contemporary comments which really added to the tour. A very enjoyable and informative day. Rita was requested to put together a tour covering those parts of Budapest not included in the Viking River Tour. What she put together was fantastic. We saw those parts of the city that gave us insight into both its history and people. I heartily recommend this tour! Rita's tour was especially designed for our group of eight covering the ancient Roman Imperial sites to the Nazi-Communist torture places. It was an excellent tour made even better by Rita's commentary. I recommend both Rita and this tour enthusiastically! Rita gave us a great tour! She is very knowledgeable, a good communicator, and very pleasant! Rita came early, has great knowledge of budapest, and it's history! My wife and I had a great time with her. Helped us find good food and shopping. Best day of trip so far!!! Rita was very personable and knowledgeable on Visegrad, her home turf. The train ride from Budapest allowed time to get acquainted and see some of the locals and the countryside. Even though there was a fair amount of hilly terrain, the pace was such that it was never taxing. A local lunch topped of the tour and allowed reflection on some significant data. TOUR GUIDE RESPONSE: Thank you Richard. I'm glad you enjoyed your day in the Hungarian countryside, you were great company and I hope to see you again one day to show you more of my beautiful country. Rita was a wonderful, enthusiastic guide who did her best to make Visegrad as interesting as possible. However, the visit to the castle, palace and town did not merit a full day visit. We are four 'youngish' senior citizens. We spent a very active, enjoyable, informative day with Rita on her Visegrad trip. She is very knowledgeable and enthusiastic and a great companion. We had a fabulous day with Rita and if her other tours are as good as this one, we would recommend her unreservedly and would book one of her tours again. This was definitely money well spent! I had Rita as my local Guide for a walking tour June 8, I was very much impressed with the Her, Rita was excellent and she gave her 100 % to our group, we were a total of 7 persons. I also congratulate you for the efficiency of your company and service, overall it was a very positive experience Alba H.
TOUR GUIDE RESPONSE: Thank you Alba. It was a pleasure to guide you and your family. I wish you all the best and hope to see you all again. 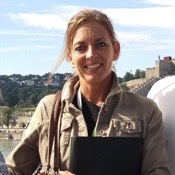 Rita has outstanding communication & interpersonal skills and knowledge of Hungary. We had a wonderful time with her in Visegrad. Rita was fantastic. She emailed and responded quickly. She met me on time and as promised and was very professional and spoke English well. She is an English teacher so this as a plus and ah was very knowledgeable and if I wanted to modify the itinerary, no problem. Thanks Rita. What a delight! Rita got it right on all accounts. A truly local experience by a local guide. She took us to really spectacular places of this beautiful country. We will be back.